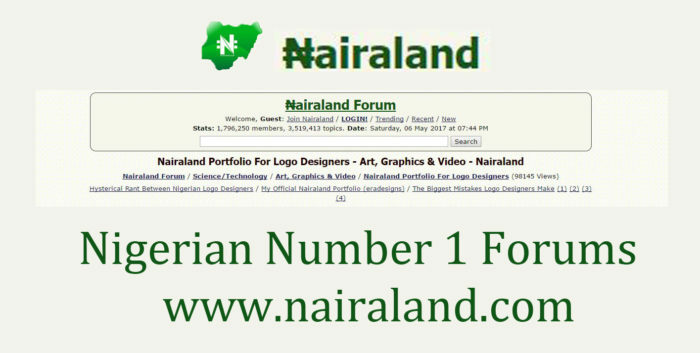 Nairaland is rated as one of the biggest online community (forum) in Nigeria. This platform is well known for its forums where users share and talk on various issues. www.nairaland.com online portal was established in March 2005 by Seun Osewa to help Nigerians interact with one another. The Nairaland forum hosts different symposiums on which its members interact and share views on selected topics. It offers latest news trends ranging from entertainment, science/technology and general reviews with an option for users to create an account. A Wikipedia review has shown that it has over 1.8 million users who have successfully created accounts on the platform. Get started on nairaland.com by signing up and keep your social spirit aloft. I call this portal jack of all trades, it covers it all. Create an account and post trends however the content of your post needs to be approved otherwise it will be deleted if the content is malicious. Read information updates and gossip on a wide number of topics, buy and sell, meet and chat with people from every part of the country. Ask questions and its members are always more than ready to give useful answers. Its members work as a team, no wonder it is rated as one of the distinctive community for discussions. These are the various category sections on the main menu where users can easily browse for other categories. There are other classifications and topics that are being uploaded by registered users such as Nairaland / General, Entertainment, Science/Technology. There are other subcategories under each of these listed categories. Nairalanders, as its members are tagged, are never bored. The only word I would substitute for this platform is “enlightenment” for that’s what it basically does to its users. Users get to ask questions as regards issues and get them resolved by other users on the Nairaland forum. Meet your dream guy and lady on nairaland dating section.You never can tell if the dude you just shoved his comment on a post to his face is the man you walking down the aisle with. there are also updates such as latest jobs in nigeria, latest nigeria news, today nigeria news and much more. Various sections feature numerous links. Some of these sections are namely: health, fashion, job searches, computers & programming, gadgets, literature, media, business, travel, career, Auto romance, education to mention a few. The admin of this platform designed the community to be user-friendly so members’ activities are hassle free. Nonetheless, users that are willing to register can use these guidelines to get started on Nairaland. Launch your preferred web browser and enter the url nairaland.com on the address bar section. Click on Join Nairaland right below the bold Nairaland Forum icon. Enter your email address and click on submit. Login to your email and Click on the activation link sent to your mailbox to complete your registration. You will be asked to enter a username and password and click on join Nairaland icon. Click on edit profile, fill in details and update. You are just in time! Enjoy your tour. Users don’t need to register before accessing the basic info but are restricted to premium features on this platform. Users can also install Nairaland Forum official app on their devices from Google Play Store. Launches the portal and instantly notifies users whenever the homepage is updated.